The best way to learn to draw and paint animals is observe them from life. But since they generally don’t pose, you’ve got to catch them sleeping, or hope they feel like standing still for a while. 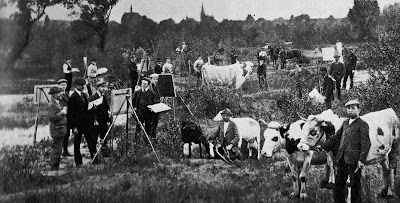 Some of the great 19th century teachers organized schools that included painting animals, and they would often hire a farmhand to hold the animals steady. Heinrich von Zügel was photographed here with his students in Germany. 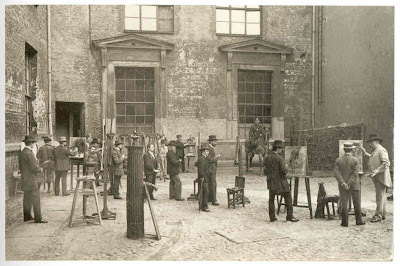 According to his account, they spent their time “drawing and painting in the daytime and discussing and drinking until midnight.” His students made precise studies indoors in the winter. In the summer they went outdoors and captured fleeting impressions of Nature. But thanks to those farmhands, the cows held fairly still. 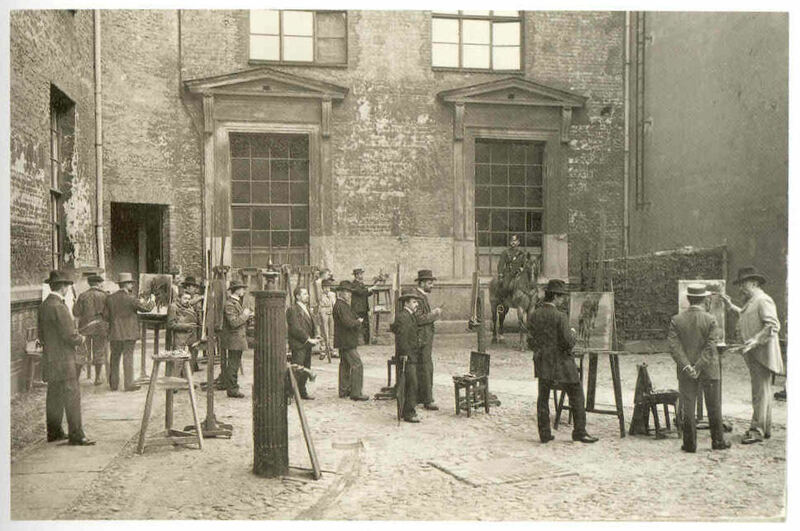 Paul Meyerheim (1842-1915), another great German animal painter, had his master students set up in a courtyard of the Berlin academy, where they worked on oil studies of a mounted horseman. 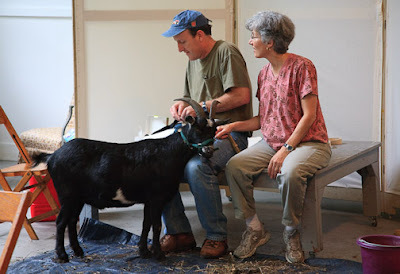 When I taught my creature design class a couple of years ago, I brought my neighbor's goat Billy, who stood very patiently for my students as they drew studies of him. Billy seemed to enjoy posing. The farmer, Lenny, knew he would. "He'll love the attention," he said, as I lifted Billy into our van. Thanks my friends and blog readers Christoph Heuer and Christian Schierkamp, who are doing some terrific research on 19th century German realists. In norman rockwell's autobiography, I recall a couple of stories about animals: 1. a farmer told him to pet the heads of chickens and they would freeze for a half hour... 2. he got a cat high on catnip. My dad catches and releases chipmunks (they tear up the garden) i sketch them when they are in the cage and sometimes they will freeze for 20 minutes or more - no doubt scared out of their wit - while I sketch them. PS American Museum of Natural history is a great place to study animals- they are beautifully articulated. I have noticed with the birds however, the 'glow' and sheen of the feathers is completely lost. I love the people painting in their suits. Carol, glad you mentioned those. I love them. I also have a set of Britains miniatures, mostly farm animals, from the early 1980s. Herman, yes, and hats. How did they keep from getting covered with paint? Pen, the taxidermy at AMNH is still state of the art. Birds must be the most difficult to get right. You can also ask to draw their study skins, which are kept in the collection. ...I'll have to try that with chipmunks. ....One other Rockwell story: didn't he somehow attach a turkey's foot to a board? Sounds awful. Turkeys can be pretty fierce. David, the logistics of getting animals to art schools is pretty difficult, so you were lucky. A few schools, like Laguna College of Art and Design, have a regular program that they've set up with a zookeeper. Love that story with Billy the goat, I was cracking up! What might as well be interesting is that Paul Meyerheim was also known as the "Löwen Meier" ("Löwe" is the german term for lion), because they were his favourite subjects. Most animals will return to different pretty similar poses after a while (not only those paralised movements that you find in animals that have been captivated in too narrow cages) and it's worth while to spend some time just watching the animals and layout some different poses on one sheet that you can switch inbetween when the animal is changing it's pose. My in-laws have a small farm with a pony and a few sheep, goats, chickens, turkeys and rabbits. I think the turkeys were my favorite to draw. Part of the fun was doing the quick gesture sketch of the pose of the animal and then I had to really study the form to do the more detail touching up of my initial sketch. It was a real challenge that helped me think about the animal in 3 dimensions rather than just a study of what I was seeing. I don't think it would be as fun if they stood still. That's so interesting! If there were a class like that today, where you draw all day and talk about art all evening, I would sign up! I'm not sure if the Pennsylvania Academy of the Fine Arts still has the animal drawing studio, but they use to have this huge studio with barn doors for a class on drawing and painting horses and other large animals.